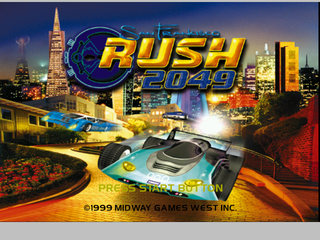 San Francisco Rush 2049 is a futuristic racing game released among other consoles for the Sega Dreamcast. Main article: San Francisco Rush 2049/Magazine articles. San Francisco Rush 2049 can utilize storage on the Dreamcast Visual Memory Unit to save player progress as well as ghosts that can be raced against in Ghost Race mode. In addition Ghost Race files can be downloaded from the Rush 2049 website that can be accessed from the game's menu.